Now that Facebook friends have finally moved on from “graduation” photos from pre-K, kindergarten, third grade, eighth grade and pretty much any other end-of-school milestone one could dream up, it’s camp time. I never knew that people sent their kids away for a month or two (or more) each summer until I got to Cornell. There I met peers who had begun going to sleepaway camp as young as eight years old. “Do your parents not like you?” I wanted to ask them. Why else would parents exile their kids for 15% of each year? Even weirder, most of my college classmates said they liked going away to camp. I found this truly shocking. When I was eight years old, I talked my parents into letting me go to Girl Scout camp. I remember that it took some effort, and that I thought they were being silly in their concerns. What concerns? That I would hate camp. Or get injured. Or be homesick. Or be actual sick. My best friend Leslie went to overnight camp at Camp Archbald before and loved it so I wanted to graduate from Camp Laurel, the Girl Scouts’ area day camp. Camp Laurel was OK except when we got dirty, and I didn’t really like the one night we had a sleepover at camp, and cooked dinner over the campfire (which took hours). I also hated the compost toilets – gross. In spite of all of this, I wanted to go to Camp Archbald like Leslie and being the persistent little weirdo that I was, I got my way. I didn’t like the food. Some of the girls in my cabin were weird, like the twin sisters who fought non-stop. I felt weird sleeping in my Kermit the Frog sleeping bag atop the plastic mattress on my bottom bunk. But most of all, I dreaded the daily swimming session that required me to go in a lake. Ack, muddy bottom and mysterious floating leaves and swimming things! Because I refused to participate in the first day swimming placement test, camp counselors placed me in the Green group, two levels ahead of little girls in Red paddling around in less than three feet of water. It was utterly humiliating. Each day during swim hour, I would get in the lake (completely under duress), find the same flat, broad rock and balance upon it while shivering and trying not to cry about the muck around my feet. Here’s the thing: I was a great swimmer, having taken lessons since I was two years old. I just thought lakes were creepy. I still do. Leslie, meanwhile, had tested into the Blue group which swam in the five foot deep water just outside the protective dock. By the end of camp she had advanced to the most proficient swimming group by completing swimming across the lake and back. I tried everything I could to get out of swimming in that lake. I told the counselors I was sick but if I didn’t jump into the lake instructed, I’d be pushed. Eventually I gave in and agreed to learn the Elementary Back Stroke. At the end of camp, I re-took the swimming test and advanced to the Blue group. I nearly lost my mind upon realizing that had I just tried in the first place, I could have been swimming in deeper water that afforded swimmers the ability to avoid the lake’s mucky bottom. Once or twice daily (!! ), I’d write home to Mom and Dad. The messages became increasingly plaintive. Consider this fact though: camp lasted just five nights. Five. All that drama over five nights. When I reunited with my parents on the final morning of camp, you would have thought I was getting to home after being a prisoner of war. Still, going home wasn’t completely sweet. You see, I was actually sick and within twenty-four hours of escaping camp, I was hospitalized with some combination of a viral infection and dehydration. Probably from all the tears that dampened my sad postcards home. PS If you suggest I go camping now, the answer will be a firm no. Unless there’s a cabin involved, with a hot shower and beds. Then I’ll reconsider. This entry was posted in Life stories and tagged camp, Camp Archbald, childhood, Girl Scouts, hospital, lake, Lake Ely, muck, Pennsylvania, sleepaway on July 2, 2014 by onechicklette. Ha! Exactly my experience, except during our “camp-out” we got started late and it was dark and starting to rain before we pitched our tents and failed to notice we were in the middle of a huge ants’ nest. About two am, when we all realized we were crawling with curious ants looking to stay dry, we broke camp amongst the screams and sloshed back to the cottages. I hated the food, the other kids teased me and the counsellors were a bunch of horny teens who spent more time with each other than with us. And the lake – no beach, only mud and floating leaves. I planned to escape by hiding on a delivery truck, but I couldn’t figure out a way to do it without getting caught. And, I had the worst hay fever of my life. And the poor little guy in the bunk above me wet the bed every night he was so scared. Oh, and I developed a wild rash, on top of the ant bites, that was likely a side effect of the hay fever. I was never so glad to get away from anywhere in my life as I was when my parents came to pick me up. My idea of “roughing it” now is a 40 foot motor home. Screw that camping stuff – I’m scarred for life and proud of it. Post Traumatic Camping Disorder. Great post OC. Thank you. Camp is hell. Thank YOU for sharing your story! Ha ha ha. I used to laugh at the kids who couldn’t hack it on the overnight, then graduated to the overnight camp when I was 10. But… I am also a huge lover of lake swimming & tent camping. I kept begging for longer and longer sessions. I loved it so much I was a counselor from ages 16-22… although I do have to say I worked at 2 big Jewish camps, mostly kids from Westchester, and was surprised at people sending 7 year olds for the whole summer. All 8 weeks. I didn’t envy the counselors in those bunks–those kids cried for like the first 3 weeks. More camp for you. Meanwhile I’m staying in fancy tents in Kenya. Ugh. Moo is ten and she wants to go to three-days-overnight church camp. 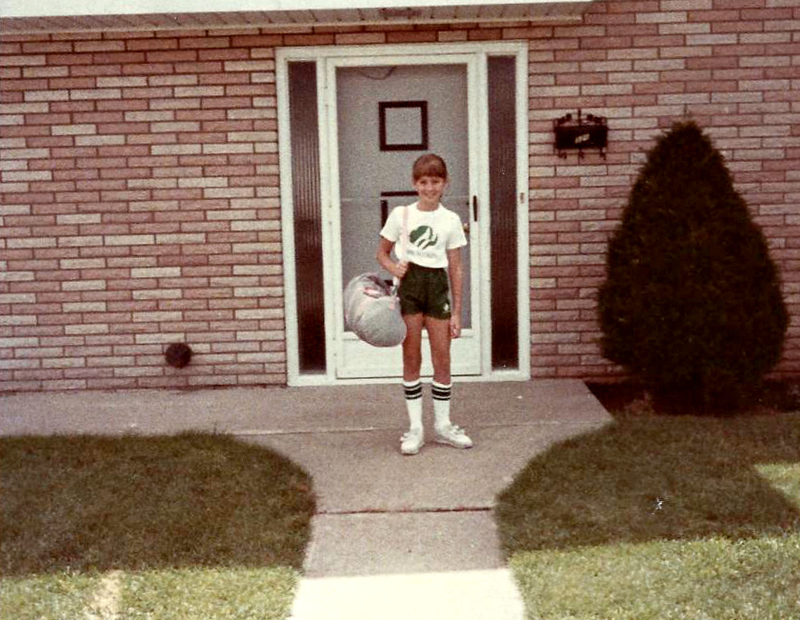 My first camp was three-days-overnight dance camp. I do not want her to go. She’s not a mature 10. Conflicted. A lot. Thanks babe. I freakin’ hated camp. When I was 13 my parents sent me to an all girls camp in Maine. I lived in Jersey. I hated the camping experience but i appreciated the learning experience! Oh & we found boys although i should say they found us! So glad we were so Innocent back then! All we did was giggle!